With the advent of every new militant group, the religious phraseology, slogans, flags and public narrative in Kashmir changed. The baseline of these groups, however, remained the same. They all wanted Kashmir to become part of Pakistan. The idea of a wholly Independent Kashmir (including PoK) as propagated by the JKLF was overrun and replaced by Pakistani flags and slogans like "Jeevay Jeevay Pakistan" and "Hum Pakistani Hain". Eisa Fazili, a local ISIS 'poster-boy', sitting among ISIS operatives. "Where is Islam in Pakistan?" and "How are you a martyr if you die for Pakistan?" is the new refrain. "Sharia or Shahadat" (implementation of Sharia Law or martyrdom) is the new slogan. The black flags of ISIS which shocked with their appearance in the Valley a few years ago are no longer a huge anomaly. Originally, the ISIS flags were dismissed by intel agencies and the administration as misguided youthful exuberance. Then the men carrying them and others wielding guns declared their allegiance to dreaded global terror groups. 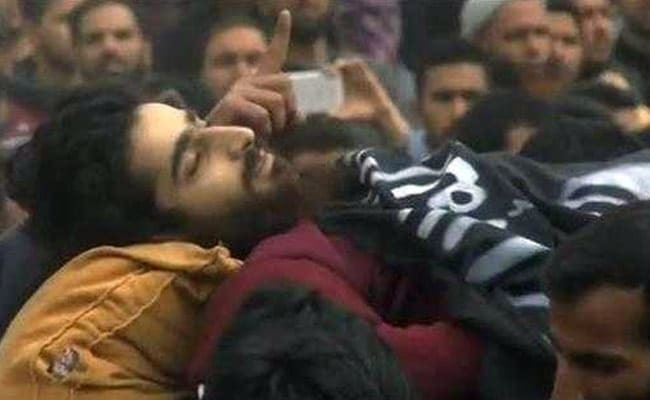 Al-Qaeda affiliate leader Zakir Musa has become a new militant heartthrob and is raised in the sloganeering of every protest and procession. This despite him threatening to hang top separatist leaders at the Clock Tower of Lal Chowk. Audio and videos recordings of ISIS describe these leaders as apostates and slaves of Pakistan's ISI. Two recent encounters - one at Balhama on the outskirts of Srinagar, and the other in the Anantnag district nearby have a frightening message. Radicalised youth influenced by the Jihadi syndicate in India and Pakistan are turning their attention and efforts to Kashmir. At Balhama, among the three jihadis killed two weeks ago was Abu Hamas, a Pakistani national who crossed the Line of Control a year ago as a Lashkar operative but switched to the Al-Qaeda affiliate in Kashmir. In Anantnag, Mohammad Taufeeq from Telangana was killed along with Eisa Fazili, a local ISIS 'poster-boy' during a fierce encounter. According to the police, Taufeeq was radicalised into ISIS ideology through online chat rooms and then travelled to Kashmir to participate in ISIS attacks. Body of Eisa Fazili wrapped in an ISIS flag during his funeral. Over the last three decades of Kashmir's separatist movement, at no point have Indian Muslims supported either Kashmir's Azadi or pro-Pakistan ideology. No one ever joined any militant group. But barely months after ISIS made its footprints in the Valley, Taufeeq found his way to Kashmir. In the last few years, more than 61 radicalised Muslim youth from various states of India have joined ISIS or Daesh in Syria and Iraq. The biggest fear is that when ISIS is being forced into retreat in those countries, Kashmir may well provide a new battleground for potential recruits. New Delhi can little afford to allow this dreaded ideology find a sanctuary in its backyard. The repercussions are too serious for entire country. 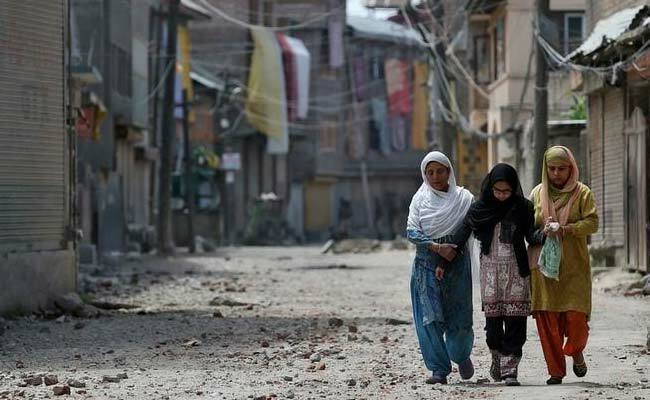 The malaise will not be limited to Kashmir. Abu Hamas's case is the first time that a Pakistani militant, typically handled by Pakistani agencies, joined a group inimical to Pakistan's interest in Kashmir. It's this global jihadi syndicate which makes Kashmir an area of convergence for radicalised youth from both India and Pakistan. 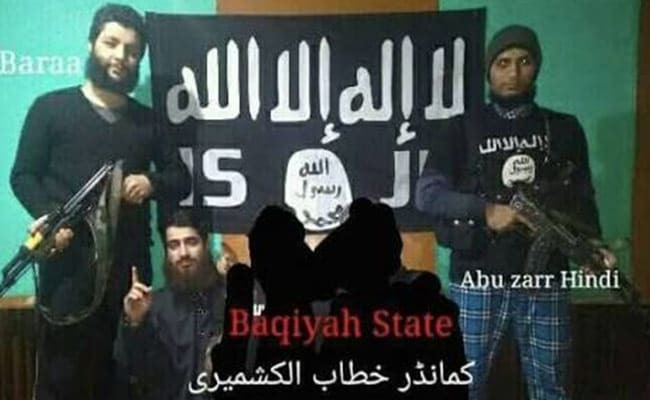 Unlike militant groups operating in Kashmir, ISIS' fight is not for territory but the proliferation of a poisonous ideology that it wants to enforce through violence and brutalisation. While there is intense debate on this new challenge, the opposition by separatist leaders to ISIS is half-hearted, partly out of fear. They denounce ISIS but glorify ISIS operatives killed during encounters. Normal life was badly affected as Kashmir saw widesspread violence in 2016. In his life, Eisa Fazili, shot in Anantnag a few weeks ago, declared his allegiance to ISIS. After his death in a shootout with security forces, his supporters wrapped his body in ISIS flags. A relative who tried to resist was beaten. Naeem Fazili, a school principal, says he had no idea if his son ever had any links with ISIS. He had even strongly opposed Eisa's plunge into militancy in August last year. While separatist leaders denounce ISIS, they glorified Eisa as a hero and martyr. It's for this hypocrisy that Kashmir is paying a price. When Osama bin laden was killed, these leaders and Kashmir's Bar Association offered funeral prayers (in absentia) for him. ISIS-type ideologues have flourishing in every insurgency hit place; Kashmir can't remain insulated. It's the militancy and it's religious glorification which has brought us to such a situation. It's true that atrocities by security forces and insensitive governments have pushed people to the wall. The rule of law has long been kept in suspended animation. Even the registration of an FIR to investigate civilian killings is not allowed. All this has led to a situation where frustrated youth see dignity in death. Sadly, young and educated youth turning to militancy has become a new norm. 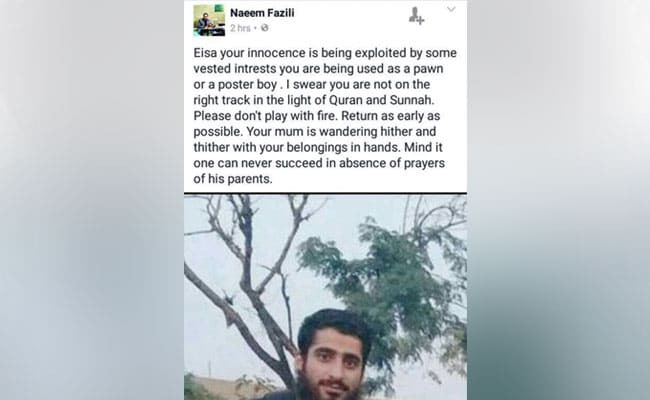 Naeem Fazili, a school principal, says he had no idea if his son ever had any links with ISIS. 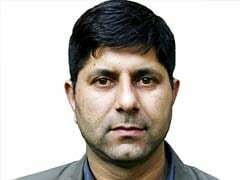 The latest entry is Junaid Ashraf Khan, a management graduate and son of top separatist leader Mohammad Ashraf Sehrai who recently replaced Sayed Ali Shah Geelani as chairman of the Tehreek-e-Hurriyat party. Mr Sherai said his son joined militancy because he couldn't tolerate "injustices" anymore. Yes, no one should tolerate injustices. But will his joining militancy make any difference, or is it going to cause more injustices? Both to his family and society at large? Given that all separatist leaders have been glorifying militancy and using deaths as their political capital, Sehrai cannot afford to disown his son's plunge into militancy. He has to swallow the bitter pill. Saving life is saving Kashmir. Misplaced bravado is only bringing miseries and prolonging a bloody conflict. Demilitarisation can start with saying no to guns. Security forces will be left with no option but to reduce and remove their footprints from the state. And yes, saying "No" to militancy and violence is certainly not political surrender. The introduction of global Jihadi ideology in the Valley is a by-product of militancy. Kashmir may find this its largest challenge yet. "Har zarre par ek qaifiyat-e-neemshabi hai; Ai saaki-e-dauraan yeh gunahon ki ghadi hai" (Firaq Gorakhpuri).